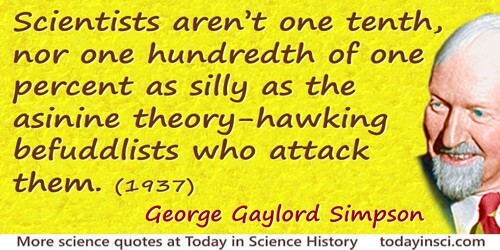 Scientists aren’t one tenth, nor one hundredth of one percent as silly as the asinine theory-hawking befuddlists who attack them. Letter from London (20 Apr 1937), No. 81, in George Gaylord Simpson and Léo F. LaPorte (ed. ), Simple Curiosity: Letters from George Gaylord Simpson to His Family, 1921-1970 (1987), 34.